No more pop-ups asking you to agree to those murky “2.1x” (or some other “x” amount) surge fares on the Uber app. Soon Uber will just tell you the price of your ride up front. Uber told TechCrunch in May it was not doing away with surge pricing and denied an NPR report mentioning it would be killing surge. However, it seems Uber is doing away with the feature. Uber pricing will still fluctuate with demand, but now you’ll know the dollar amount you’ll be paying for the ride, instead; “no math and no surprises,” says Uber. uberPOOL introduced riders to exact fares two years ago and the ride-sharing company started to notice something — people seemed more likely to take Uber again when they were told up front how much the ride would cost. “Knowing how much a ride will cost in advance is clearly something riders appreciate: today uberPOOL accounts for over 20 percent of all rides globally,” a post in Uber’s newsroom says. Of course, uberPOOL is less expensive and it is also possible riders returned to Uber because of the cost savings on POOL, not because Uber told them how much the fare would be before they hopped in the car. But Uber’s product team has been testing the idea of offering the exact cost of the ride in select cities throughout the U.S. and India since April and says it believes riders are more likely to take another Uber in the future if they see the trip price upfront, not just because POOL is cheaper. The new costs are calculated similarly to the old “x” surge pricing so you might still end up paying a ridiculous sum in certain places or times of day where demand for a ride home is going to be high. The price is based on expected time, distance, traffic, the number of riders requesting rides at that time and the number of drivers available nearby, but at least now you’ll know exactly how much of a punch the ride will make to your bank account. Uber will also allow either the driver or rider to update the app if you change your destination in the middle of the ride and says you’ll get a notification in the app with the change in price. The rideshare company also told me you won’t have to worry if your Uber driver goes way off the map and tries to charge you more or if the route is suddenly busy and they need to change course. The price you agreed on will still be the price you pay. So no more lightning bolts and pop-up screens asking you to agree to “3x” surge or whatever it is after you stumble out of the bar or head all the way across town. Just like with hotels and airfare, the prices change all the time, but you’ll know what the price is before you book. According to Uber, “hundreds of thousands of riders” have already received the pricing transparency rollout — including those in Miami, San Diego, Seattle, New Jersey, New York and some of the bigger cities in India like Mumbai and Hyderabad. 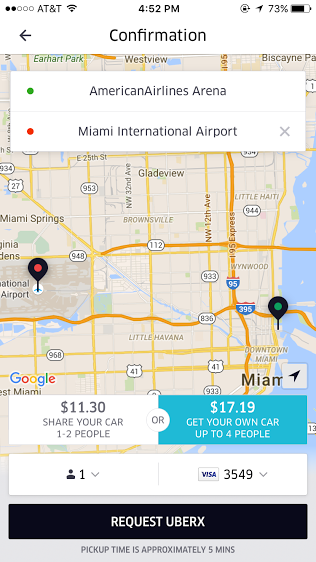 Uber plans to roll out the changes to pricing in the app globally in the next few months.